It’s easy not to be a millionaire. Most of us aren’t. 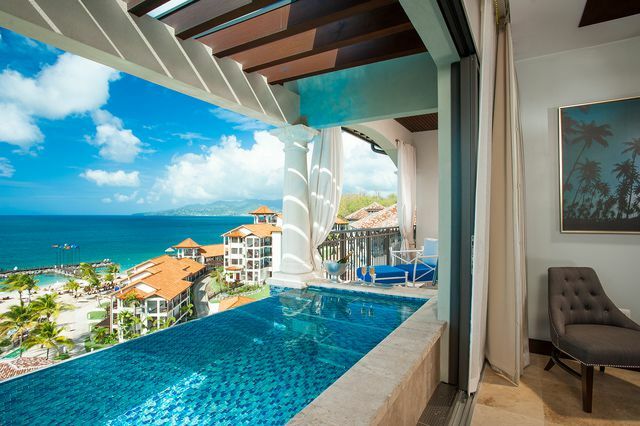 But you can vacation like one at the Sandals LaSource all-inclusive resort in Grenada. Or so it says in the resort booklet. Funny thing is, it’s pretty accurate. The resort, which opened in April 2014 to rave reviews, is a beauty of an all-inclusive resort—luxurious, well-appointed and ideally located close to Maurice Bishop International Airport on the island’s southwestern corner. Sandals, which also runs Beaches Resorts, does it in style. And not terribly expensively, so you don’t have to pony up like a millionaire. Sandals LaSource is big at 231 rooms, but being spread out over three villages takes the crowded feel away. Pink Gin Village is two blocks of rooms in an area that had existed in a former life before Sandals bought the property to renovate and expand. The Italian Village is perched on a cliff overlooking the resort, and there are two other villages, Lover's Hideaway and South Seas. A suite at South Seas Village is pretty posh. It's conical, with a thatched roof, a big high-definition TV, a king bed, and a giant soaking tub that sat on a blanket of smooth river rocks. You have your own personal outside plunge pool, a good-sized watery escape that you can step into from a set of doors that opened above it. The pool and nearby hot tub were lined with iridescent tiles, and both glowed at night with changing red, green, and blue lights. And on top of all this luxury, the room comes with butler service. A nice all-inclusive feature here is the fully stocked bar, top-flight stuff such as Appleton rum, Tanqueray Gin, Absolut vodka, Johnnie Walker Black, and wines from Stone Cellars. It’s all yours, whenever you want it. As lovely as the rooms are, the bigger draw is the Caribbean sunshine. The beach, while roomy, wasn’t particularly spectacular. It's gritty, not smooth, with black volcanic sand flecked with well-worn shells and coral. There are ample loungers and umbrellas to escape the broiling sun and two protective rip-rap walls that create smooth swimming inlets. On one wall are hanging scoop chairs to take in the magnificent sunsets. Another reason it doesn’t feel crowded: Nine restaurants, all good, one a newer signature eatery, Butch’s Chophouse, named after Sandals’ founder, serving grain-fed Midwestern beef. Soy is a sushi bar where service is friendly, and the food is as free-flowing as the delicious warm sake. Another good option is the Italian-themed Cucina Romana, where in addition to regular pasta, the gluten-free variety is offered. The food here was authentic, the pasta sauce tastes like it was made by somebody's Italian mother. Other possibilities include Spices, especially for breakfast, though with a menu that largely caters to American tastes. Still, it uses liberal doses of Grenada’s native spices, including nutmeg, mace, cinnamon, clove, and pimento, bringing even mundane American food to island life. Neptune’s for lunch is the best bet. It's set on the beach, open to the elements with seating fronting the ocean, and serves classic Mediterranean Rim cuisine. The menu is varied and naturally heavy on seafood, but it also has some of the best and spiciest jerk chicken ever. If you want to cool in the pool instead of the sea, there are five options, including a beachfront pool with a unique set up: A stone lounge with a fire pit that extends into the center of the pool, a great place to relax with friends. If that’s taken, there are many other fire pits scattered throughout the resort where you can warm up at night. Red Lane Spa is also here; you can get a basic but very good massage, oily, aromatic, and relaxing. Sandals is known for its “luxury-included amenities,” and here that includes glass-bottom boat rides, a Red Lane fitness center, stand-up paddle boarding, Hobie cat sailing and windsurfing, kayaking, day and night tennis, snorkeling, and scuba diving for certified divers. There are plenty of partying options as well, including themed cocktail parties, beach bonfires, live music, and dancing. It’s true you don’t have to be rich to vacation like you are. But at Sandals LaSource, you’ll at least feel like a million.